MAX 4G is HTC’s first WiMAX equipped smartphone based Windows mobile OS .Data connection and display are the main features of this phone .It is capable of accessing fastest and next generation wireless internet on its massive 3.8 inch touch screen . HTC MAX 4G doesn’t have 3G support,but its will work with all 2G GSM carriers . Other specifications includes a 3.15 mega pixel auto focus camera ,8 GB storage, 288 MB RAM and 256 MB ROM . It will be powered Qualcomm ESM 7206A 528 MHz processor. All other basic data transfer, multimedia and navigational features are also available . HTC MAX 4G looks just like HTC Touch HD with a change in screen size and data networks supported . Many network carriers in India doesn’t support 4G , actually 3G itself was started few months back . So HTC MAX 4G is not worth as we cannot make use of its possibilities . 3.8 inch large WVGA display is the main attraction of HTC MAX 4G . 3 mega pixel auto focus camera without flash . 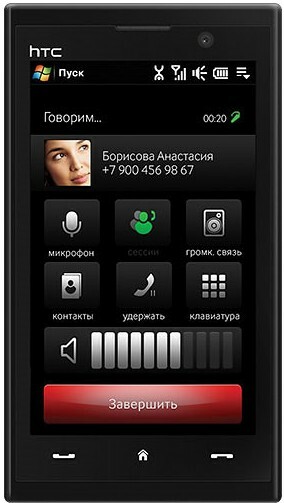 HTC MAX 4G uses Windows mobile OS 6.1 professional . So there will not be any scarcity of applications , themes and games . No camera button and flash . The global launch of HTC 4G was early this year ,for a whooping price tag of 1000 USD . So in India it will cost around 48000 INR . Update: HTC announced another WiMax phone, HTC EVO 4G with Sprint network in US. Can you let me know if you have any high end phone without camera ?